... it can only be Italian .. can’t it?. 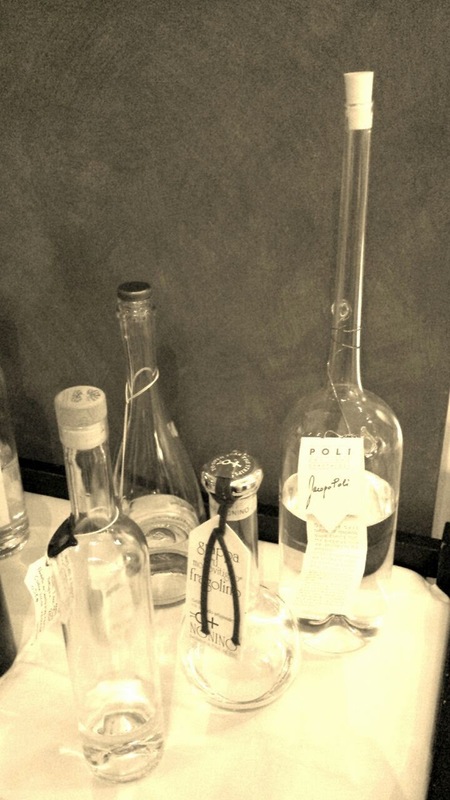 Yes you got it .. it's Grappa, but don't go away there's more to come .. Grappa and it's European colleagues are known as a Pomace brandy made from the “leftovers” of wine making, via distillation. It’s thought distillation dates back as far as 3000 BC in the far and middle east, but it didn’t reach Europe until as late as 6000 AD. The “fruits” of distillation remained pretty much medicinal in purpose until the 16th century though until the Dutch began making gin, the French joined in with cognac, and the Scottish got started on whisky, and we fell upon it all with glee, as the "elixir of life". The USA was on the bandwagon by the late 18th century, and in no time at all the "cocktail" was born. However, while it may have been the grappa trolley that kept me at Enoteca Turi, it was not what drew me there in the first place. Hidden in plain view on a corner of the Putney High Street, this little oasis is one of the city’s best kept secrets, unless of course you are Italian. Apparently it's also especially popular with visiting Italian winemakers, possibly due to its fantastic Italian wine list .. as well as the food. So how come you know about it Ted? … well, it was the birthday of my friend who lives over that way and shall of course remain anonymous (Gill) so off we trotted for lunch with her equally anonymous hubby (David). Gill and I choose our courses from the menu and David (being of Italian heritage) choose a whole new take on “off menu”. He gave the Maître’d a few clues as to his food and wine flavour profile and the parts of Italy he liked best, and then put his wining and dining entirely in the hands of the staff. Such a brilliant idea … wish I’d thought of it!! Naturally they delivered with stars. We had the works from chestnut soup, Jerusalem artichoke flan with a soft truffled egg, warm seafood salad, delicious pastas, followed by venison ragout, pheasant, and monkfish with clams, all with matched wines. I was back in Italy with every mouthful of every course. Around us, large, extended, Italian families enjoyed their multiple courses with audible appreciation. I remembered that Italians will travel many many miles for a good meal ... I only had to go to Putney. Sounds like a fantastic place and it made me think of some memorable meals I had while visiting Italy. Another of your wonderful, scholarly posts about food, Ted. And, nice photos of the phood.